EPP SHO noisemaker eliminator pipe [SHOEliminator] - $150.00 : Eco Power Parts!, More Power for your Ecoboosted vehicle! 4/13/19 - these pipe are currently on backorder, we will receive our new shipment by 5/15/19 at the latest. If you submit for a meth bung please allow 3-5 business days for it to be welded on, for powder coating also add 3-5 business days. If you order a raw pipe, these are in stock ready to ship. 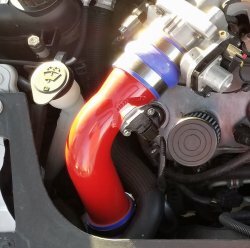 This pipe replaces the factory throttle body to intercooler plastic/rubber pipe and the "noise maker" with a straight 3" to 2.5" metal pipe with MAP sensor mount.